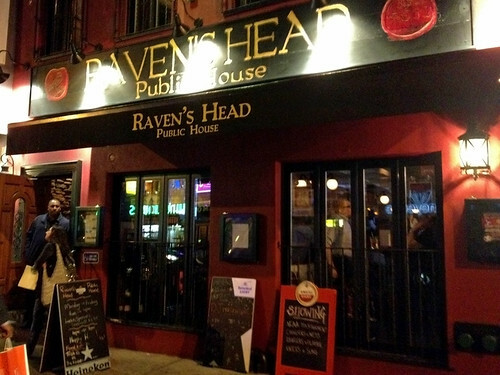 My boyfriend had a craving for pub food, so after bypassing a few other spots in Astoria that were too crowded on a Friday night, we ended up at Raven’s Head. I had walked by this place a few times since it opened, but had never ventured inside until now. I was impressed by how spacious it was inside - although the front bar area was packed with weekend revelers, there was a whole back room of seating for customers more interested in food than drink (we just wanted a late dinner, we'd had a long week and weren't up for a wild night!) 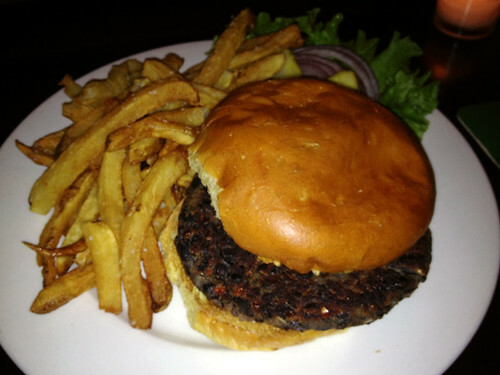 And even more pleasantly surprising, they had a veggie burger! 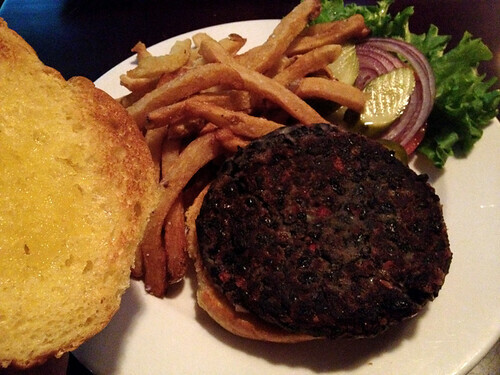 It’s even listed as “home made black bean burger” on the menu – which I was really excited to read (since too many pubs take the easy way out and serve one of those awful generic frozen veggie patties!). When I inquired as to whether it was vegan or not, I was told that the home made recipe includes butter, so it is neither vegan nor dairy-free, but still vegetarian of course (although no guarantees that it is cooked on a separate grill – so if that is important to you, best to ask, as always). The patty was definitely homemade – the main ingredient was of course the black beans, with some onions and peppers mixed in too. The consistency was good, but the overall flavor was disappointingly bland. It needed some spices to liven it up! Black beans on their own are not so exciting, but they work so well with many spices, so I was surprised that more thought was not put into the flavor. Still, it was a nice hearty, healthy burger - better than I had been expecting to eat when we had decided to go out for pub food! The bun was a nice, soft brioche – lightly toasted. The toppings were your basic tomato, lettuce, onion, and pickles. All fresh, no complaints there. I just wish there had been some kind of sauce to give the burger that extra flavor boost though! You can order cheese or avocado for an extra price, but I didn’t feel like spending $2 on some avocado slices that night. However, it did come with fries – and you know I always love a burger that comes with fries included in the price! 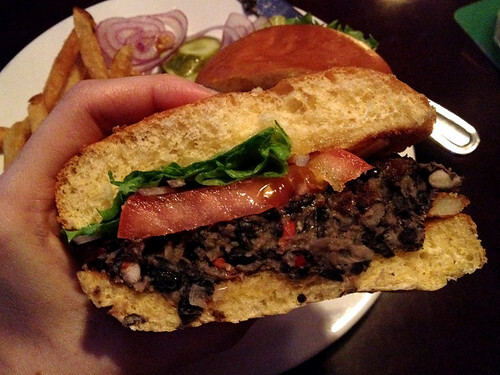 There were a lot of other vegetarian options on the extensive menu as well – so if you are looking for a pub in Astoria with more exciting food options than the usual bar fare, Raven’s Head is a good option. P.S. Bonus Trivia – did you know that a group of ravens is called an unkindness of ravens? That’s one of my favorite language facts!